PeoplePlus Cymru learner Jarrad started the Engagement programme with us in October 2018. Since starting he has worked hard achieving all targets set for him and more. Jarrad has shown a clear commitment from the start and is well liked member of our Merthyr centre by all staff and peers. Jarrad spent the first few weeks in centre where he successfully completed all aspects of induction before working on his soft skills and employability skills with our tutor. 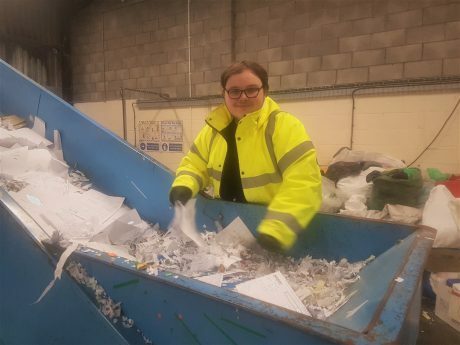 During induction Jarrad attended a visit at a local recycling company which he found very interesting, this was later to become Jarrad’s placement. Jarrad has always put a good effort into developing his skills after school. He completed a painting and decorating course at Merthyr College before coming to PeoplePlus. When Jarrad was a baby he had heat convulsions after having an MMR injection which lead to complications. Jarrad’s parents took him to see a professor in London who confirmed that Jarrad had serve learning difficulties and shows signs of Autism.